BLUE HILL - If people came to Melanie's Maine concert last week expecting to see a relic from the 60's reliving lost fame and playing old tunes they may have been disappointed. It is true that Melanie Safka performed at Woodstook in 1969 and is known for several hits that came out in the early 1970's such as "Look What They've Done To My Song, Ma" and "Brand New Key." But she's spent much of her career trying to leave behind the image of the cute vulnerable young flower child she gained more than 20 years ago. Melanie was rediscovered last week by a small crowd that caught her performance at the Left Bank Cafe. The Left Bank Cafe is really the downstairs of a remodelled home. The rustic cafe seemed made for Melanie who soon created a feeling as if those present were intimate friends invited over for an impromptu jam session. At 49 Melanie no longer comes across as a flower child but instead a seasoned and salty performer who never takes herself too seriously. Despite the years, however, the mischief is still in her eyes and the rebel still filters through her music. "This is as free as I've ever been, as far as doing what I want to do," she said after the concert. Much of that freedom comes from Lee Weissman, a classically trained guitarist, who opened for Melanie and did back up vocals and guitar for her while she sang. She would play, change directions, speed up, and, at times, suddenly stop to explain something on her mind. Melanie said she hates to rehearse and loves playing with Weisman because he seems to be able to anticipate her next move even though they only first met weeks ago. She said she has never before connected with a musician as well as she has with Weissman. After the show Weissman said that during each show she launches into at least three unplanned songs that he's never even heard before. He said at the Left Bank Cafe she did about five songs that took him by surprise. He not only was able to accompany her into the new territory but played off her banter with his own comments and melodies. Melanie was also backed with vocals by her daughter, Jeordie Schekeryk. The 21-year-old, who looks a little like her mother did in the 1970's, added a beautiful blend to the music, contributing strong clear back up harmonies that never overshadowed her mother. "I feel like this is really it," Melanie said of her career. "This is my time now. It strikes me funny when people come up to me and say, "You're just as good as you used to be" and I think, 'Are you kidding? I'm so much better than I used to be. It's not even close." Even in the early 1970's Melanie was already tiring of repeatedly performing her hit songs and preferred European audiences that seemed more open to her new music. Before she performed at the Left Bank she said she would sing some of her old hits if she got desperate. Last week she only did a few old favorites but it didn't seem to be out of desperation. She answered a request and sang "Brand New Key" but not without apologising for the way the light pop tune evolved and took on a life of its own. "This one was so big," she joked before singing the song, "that I couldn't live this one down. This was like getting me to play in 8,000 seat auditoriums, you know, and I was playing to people I wouldn't necessarily invite (to my concert.) This transcended taste." 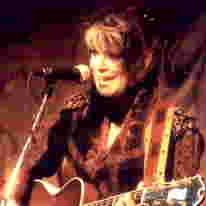 Melanie's latest CD, "Unchained Melanie", was recorded with Weisman, Jeordie, her other daughter, Leilah, 22, and son Beau, 15, among others. The music is clear, peaceful, and rewarding. It should appeal to her die-hard fans who've tried to keep track of her over the years. It could also, however, win her a new audience. Her voice seems deeper, more steady and her tone more mellow than it did in the 1970's. Melanie was an unknown when she went for an acting audition and accidentally ended up in the wrong office in the late 1960's. It was there she met record producer Peter Schekeryk who asked her to play. She ended up going home with a recording contract. They were married in 1968 and he has been her manager and husband ever since. Melanie said that she was uncomfortable with her fame of the early 1970's. "I had hit records and I wasn't real star material, you know," she said. "I mean really and truly, my personality is . . . if I go to a party I end up in the corner talking to the quietest person in the room. I'm just that kind of a person." Melanie said she could use a little more fame now days. She said she likes the fact that she can do ordinary things without being recognised but she said her professional life would be easier if her work were better known. The 1980's was not an easy time for her professionally. She had recorded with so many different labels that she hasn't had one record company consistently promoting her work. She said she never stopped working but felt as if a wall had come down making it more difficult for her music to be heard by a larger audience. She said some people have just ended up wondering what happened to her. Melanie said she has done a lot of work in Europe where she has had a recent hit and is promoted by a major label. Melanie's latest limited-edition CD is "Unchained Melanie"
Her children have formed their own band called "Safka" and released a CD called "A Foreign Film." That can be obtained by writing to the same address. Weissman's latest release, "Serephia," can be obtained by writing to "Friends Of The Guitar, 50 Norton Road, Easton, CT 06612."